CALGARY, AB (July 9, 2012)  The precision is evident from the moment the 62 members of Fanfarenzug Potsdam appear at the gate. The crisp alignment of the files and exact position of the free hand suggest that this band has arrived ready to compete. It gets even better when they take their first step, with a red stripe down the leg of white pants drawing attention to the perfect unison of their forward march. Fanfarenzug Potsdam (loose translation: Potsdam Bugle Band) has traveled from Germany to Canada to compete at the World Association of Marching Show Bands (WAMSB) World Championships, which are being held in conjunction with the 100th Anniversary of the Calgary Stampede. The band is competing with bands from Europe, Asia and North America in various parade and field contests taking place over six days. At the field preliminary contest on Monday, the band generated cheers when the drill evolved into recognizable shapes such as a music note and a treble clef sign. But when the band gave a nod to the host country by forming Canada's signature maple leaf symbol, the crowd was whipped into a cheering frenzy. Spectator Bruce Fraser raved about the band through a post on Facebook by saying, "This band was great! Crowd favorite for sure and best of the day!" Band director Bettina Bels was visibly elated while waiting for the announcement of scores. She agreed that regardless of the outcome, the trip was already worthwhile because of the connection the band made with the audience. "We were overwhelmed by the viewers because they stood up," Bels said. "I cried because of the great reaction." As it turns out, the band also made an impression on the international judging panel, which featured nine judges from six different countries. Fanfarenzug Potsdam scored 89.4 which was the top score in their preliminary round and the second highest preliminary score overall. Fanfarenzug Potsdam is a traditional German bugle band, and marches with only snare drums, toms and valveless bugles. Music director Anja Knüpfer said that although the bugles have no valves, a lever allows the performer to switch between two keys: B flat and E flat. 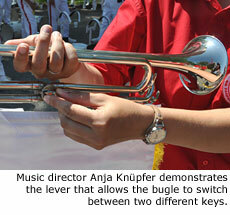 "The bugle can produce 11 tones in each key, so the lever gives us 22 tones," Knüpfer explained. The performers hold the bugle with one hand, and the free hand is typically placed firmly in position at the hip. And since precision is so important to the band, when a key change is required, even the hand movement is carefully choreographed to appear in unison. 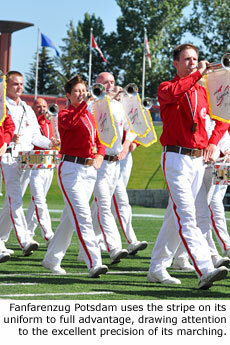 The band is no stranger to WAMSB nor the Calgary Stampede. The band was first runner-up at the 2010 WAMSB World Championships, and was the 2009 WAMSB Parade Band Champion. Bels said this is the band's fourth trip to Calgary, after also appearing in 1993, 1996 and 2000. 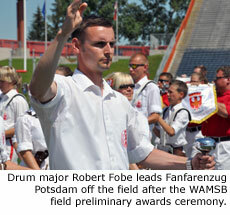 Just last month, Fanfarenzug Potsdam won first place at the German championship for bugle bands. But of course the band has come to compete. Knüpfer said the band expanded their usual rehearsal schedule from three nights per week to four or five nights per week ahead of this competition. Even with all this preparation and the long history of competitive success, in Calgary it is the welcoming crowd that is most memorable for drum major Robert Fobe. "The crowd response was so great! They really helped draw the performance out of us," Fobe said. "It's the best performance I have ever seen from this band." Related content on Marching.com: View WAMSB Opening Ceremony and Prelims #1 photos, WAMSB Prelims #2 photos and WAMSB Parade Band Contest photos.